Girl and Boy Scouts (K5 & up) are invited to spend an evening at the Wisconsin Humane Society. 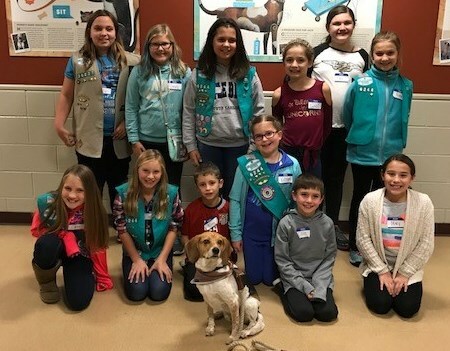 Scouts will take a behind the scenes tour of the Wisconsin Humane Society, learn about and interact with an adoptable cat and make a cat toy to take home. They will also learn about dogs and positive reinforcement training while spending time in Dog Town. There is a $8.00 per scout and $5.00 per adult chaperone fee due at the time of registration. The fee is non-refundable if you cancel less than 30 days from the event date or don’t show up for the event. Due to limited space, adult chaperones are limited to a MAXIMUM of one for every four scouts. Carpooling is highly recommended. Due to the large number of scouts and chaperones that attend Scout Night, we kindly ask that siblings under the age of 5 stay home. Siblings 5 years old and older may attend, but must register as a scout. A consent form must be signed for each child to participate in the program (Consent forms will be provided with confirmation of payment and are due the evening of the event.). Registration closes the Monday before the scheduled Scout Night. Exclusive Wisconsin Humane Society patches available to purchase at the time of registration for $2.00 each. If you have questions, please contact Britney Kruesel at (414)431-6153 or bkruesel@wihumane.org.